Pride, dignity, admiration and faith are on beautiful display in this moving sympathy arrangement. 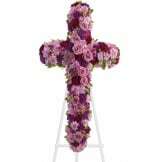 The Deepest Faith Cross is a meaningful way to deliver your heartfelt message. 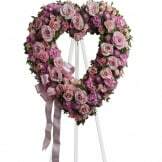 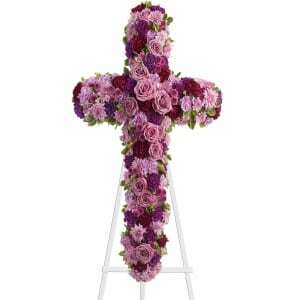 • Beautiful flowers such as lavender roses, carnations and cushion spray chrysanthemums along with fuchsia and purple carnations and button spray chrysanthemums create a dazzling cross that is full of hope and devotion. 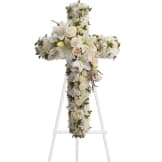 • This cross measures approximately 23" W X 38" H.
These flowers are absolutely beautiful!